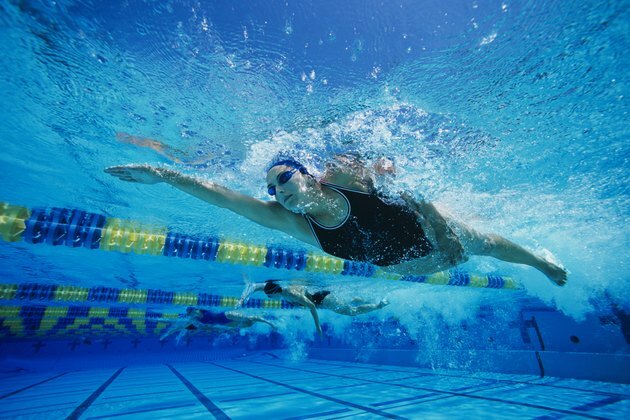 Swimming is an aerobic exercise that works the entire body and burns lots of calories. Because swimming recruits so many different muscle groups for a prolonged period and those muscles work constantly against water’s natural resistance, the potential for fat-burning is high. Swimming is also non-weight-bearing, which makes it a good option for the elderly or anyone looking to protect their joints. Like all cardio routines, what you gain from swimming depends on how much time and effort you put into it. How many calories a swim session burns will depend on several factors, including the water temperature, swimming style, distance, intensity and the fitness level of the swimmer. For a 155-pound man, swimming a freestyle stroke for one hour could burn 500 to 700 calories, depending on swim speed. A pound of fat is equivalent to 3,500 calories, so to burn 1 pound per week you must burn 500 more calories than you take in per day. A few hours of swimming per week can help create this calorie deficit. In the example cited above, the swimmer performed one hour of swimming at a steady pace to achieve an increase in aerobic fitness and to burn high amounts of calories. This type of cardio workout is standard practice, but research indicates that interval training burns more fat with less time spent exercising. If you don’t have time to swim an hour every other day, try interval training. Swim at a higher intensity for one to five pool lengths, then rest for two to three minutes. Allow breathing to return to normal, then repeat. It is not easy to compare different aerobic workouts to say which is better at burning fat. When you compare swimming and running, for example, you must note that swimming puts much more emphasis on the upper body than running, which can increase estimates of calories used. But the elevated heart rate while swimming is generally lower than the heart rate of a runner because it is easier to pump blood horizontally than vertically. Estimates rarely agree on which exercise burns the most fat, and the best routine may just be the one you enjoy the most. If you do not have access to a full-size lap pool, you can buy a specialized swim tether that will hold you in place as you paddle at your local or smaller backyard pool. These tethers wrap around your ankles or waist, and they can be useful for those who have trouble staying afloat while swimming. Every swimmer should invest in a good pair of goggles designed to add as little drag as possible and to not fog up as your body warms. It is important when swimming to exercise safely under the supervision of an experienced partner or lifeguard. OutsideOnline.com: How Does Swimming Laps Compare With Other Aerobic Workouts? How Many Calories Should a Competitive Swimmer Eat?